In the night’s most emotional game Fluminense beat Argentinos Juniors 4-2 away from home and snuck through on goals scored (eliminating Nacional from Uruguay in the process). The Brazilian spots mathematicians gave them an 8% chance of qualifying for the next round before the match. Fred scored the goal that sent them to the next round with one minute left on the clock. 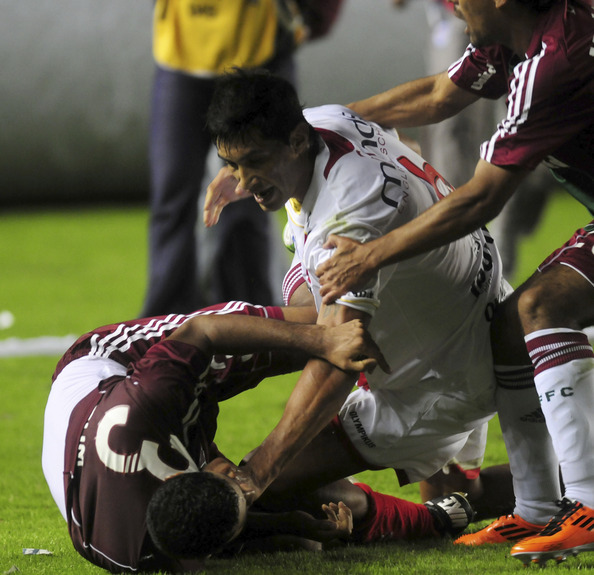 The end of the game was marred by some disgusting scenes though as Argentinos Juniors’ players started a mass brawl with a series of Kung Fu kicks on Fluminense players and coaching staff. Some of the Fluminense players responded in due fashion although most of them were trying to stop the fight and getting kicked for their efforts. Shameful and if you ask me the instigators (some Argentinos Juniors players) should be sent to jail. As for the football, Fluminense deserved it and their captain and talisman, Fred, scored two goals and held his nerve from the spot in their hour of need. Great player, Fred. Internacional beat Emelec 2-0 with goals from Damião and Sobis to finish top of their group. Cruzeiro meanwhile have been trailblazing their way through the competition and finished top of their group by a mile and scored a bucket load of goals in the process. They must be the competition favourites. Grêmio meanwhile fielded a weakened side for their last match with qualification guaranteed but were thrashed 3-0 by a weakened Oriente Petrolero. Meanwhile. Corinthians’ new big name signing Adriano has been ruled out for five months with a ruptured Achilles tendon without. The player arrived at Corinthians seriously overweight and was put on an intensive fitness programme. His body couldn’t take the pressure though and his Achilles went this week in training. Oh dear…. This entry was posted in Libertadores and tagged Adriano, Corinthians, Cruzeiro, Danilo, fight, Fluminense, Grêmio, Internacional, Libertadores, Neymar, Santos by Brian Davidson. Bookmark the permalink. If all brazilian teams pass through to the next round, Cruzeiro will face Santos, and Inter will face Gremio (Grenal!). Cruzeiro and Santos, in my opinion the best teams in Brazil (surely top 10 in the world), nothing else to say. Inter x Gremio would be amazing as well. Also great teams, and a rivalry similar to Real and Barça.